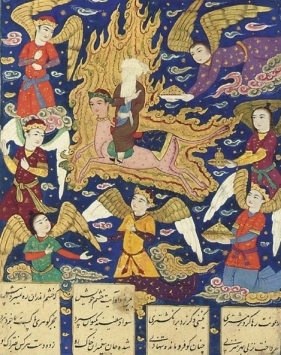 Many prophets and saints have experienced Ascension (meeraj or miraj), of which the greatest and most illustrious is that of Mohammed, the Prophet of God. 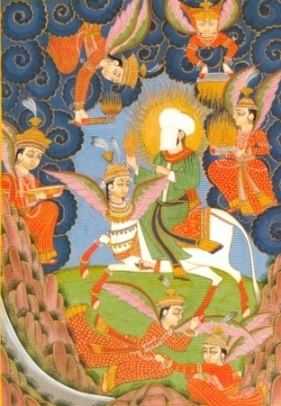 The Prophet was first taken from Mecca to Jerusalem during the Night Journey (Isra), on a heavenly steed called Buraq which is reminiscent of Pegasus, the flying horse. From there, the Prophet began his spiritual ascent orthogonal to the four-dimensional space-time continuum. He traversed the Seven Heavens, until he reached the Paradise of the Essence, where he was granted communion with God Himself. 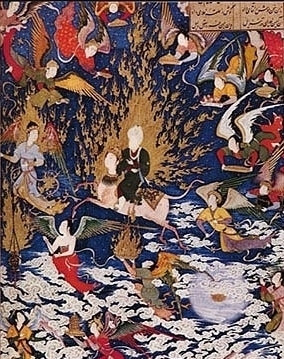 The Ascension, or Heavenly Journey, has been depicted on various occasions in Islamic art. 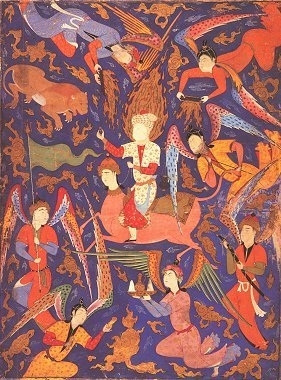 In almost all of them, the Prophet is seen mounted on his heavenly steed, surrounded by various angels, and wrapped in the flame of Supreme Enlightenment. Note that his face is almost always hidden by a veil, in recognition that no image could do justice to that radiance.